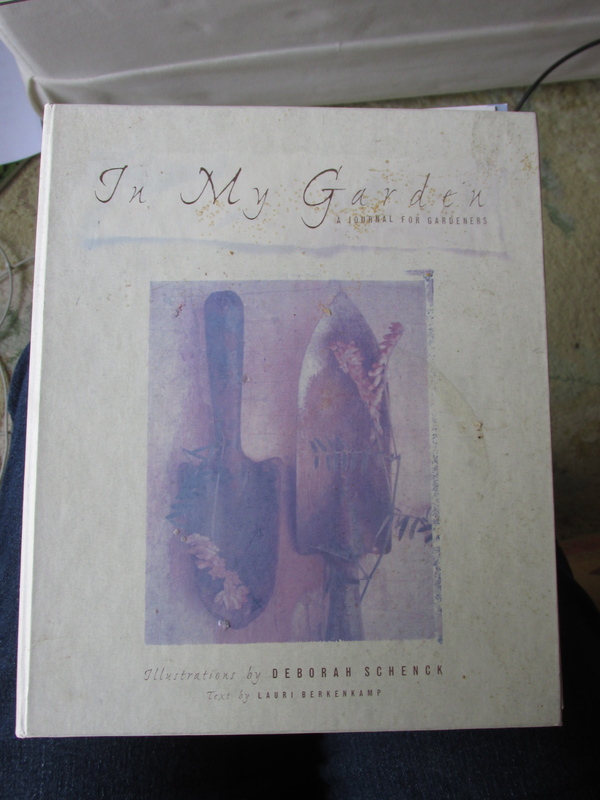 This is the Garden Journal my friend Candace gave me several years ago. You can see the cover is faded, and decorated with coffee stains. Its’ Garden Tribe’s Day 6 of 21 Day Boot Camp, and today we’re going to draw out the “what” and “where” of your 2015 successful vegetable garden. Have a good look at the pencil sentence in the middle –click on the image to enlarge it– you’ll see I have had some impressive failures. But I’m getting better, slowly but surely! 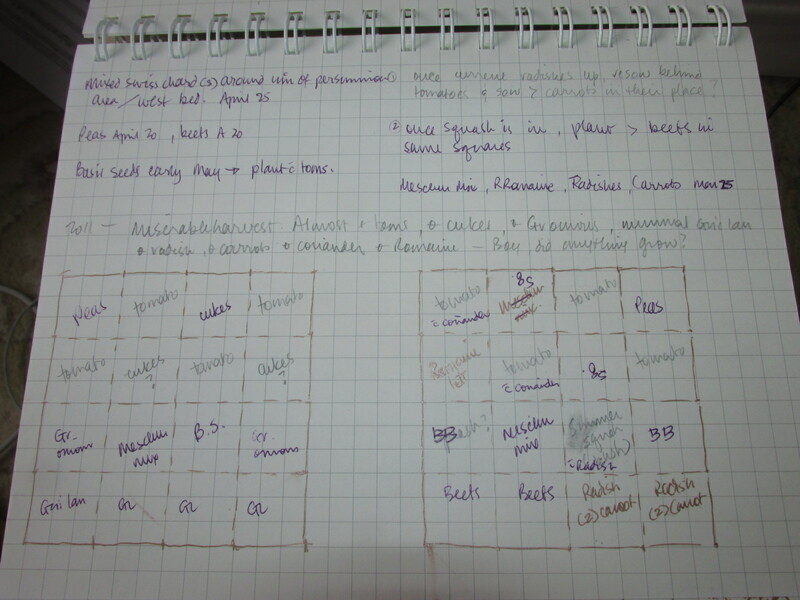 This was a “square foot” garden, raised beds 4′ square, so it was easy to draw. 4. Start drawing in pencil so you can change your mind and move things around. 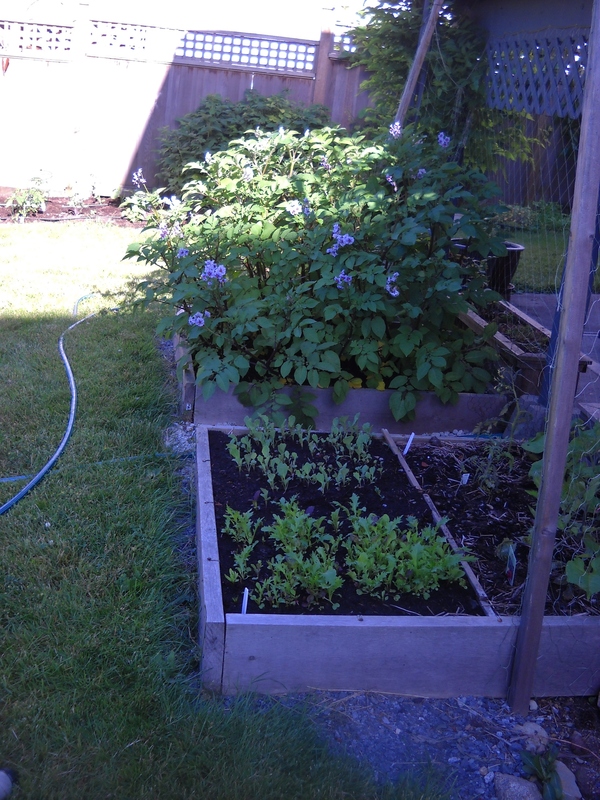 So, taking my 2011 garden above as an example: I wanted 8 tomatoes, and they had to be in full sun. But they cast a lot of shade by mid-summer, so they had to be at the back of the garden. But they also take up more than 1 square foot, so I staggered them. Peas are planted behind toms at the corners, which won’t shade them because the peas will be finished by the time the tomatoes are getting big. So just get stuck in there–this is where it begins to get fun, actually putting your project into action. We’re continuing with Garden Tribe’s 21-day Boot Camp for new edible-gardeners. Today’s topic: When and How to Start. Some plants like to grow in cooler weather, some in scorching hot weather. 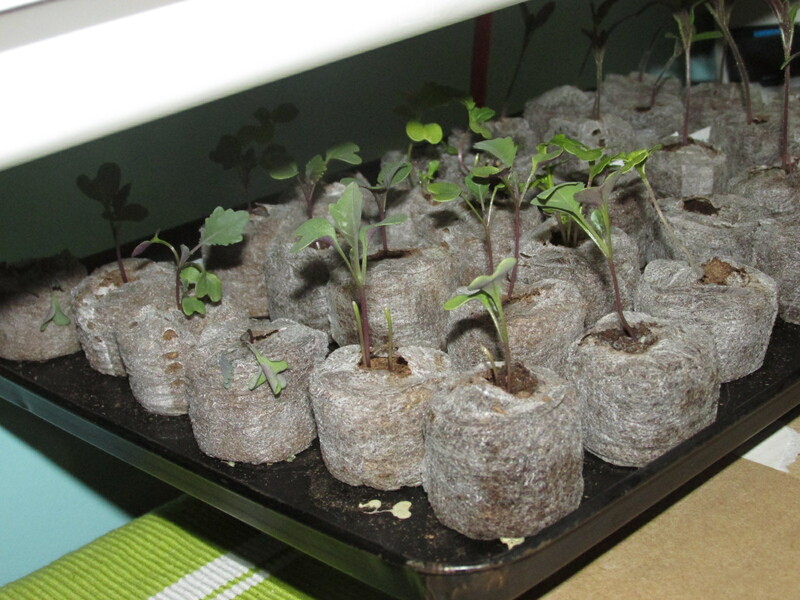 Some like to be started indoors under fluorescent lights, some prefer to germinate right where they’re going to grow. It’s good to know which is which. Again, let me refer you to West Coast Seeds’ Planting Charts. I write on my calendar the dates I want to be sowing specific crops, whether direct sowing or indoor starts. Lettuce: a cool weather crop, lettuce germinates in warmish soil, but not hot soil. So when the temperature is over 22° C, just wait until it’s cooler to sow another crop. And although you can definitely direct sow lettuce, you may get more predictable harvest if you sow indoors and transplant seedlings. Another thing about lettuce is that it will flower and set seed when the heat of summer comes, at which time the leaves get quite bitter and unpleasant. They do tolerate shade better than almost any other vegetable, so shade-planted lettuce with last longer into the summer than sun-planted lettuce. Most other leafy greens: Collards, mustard greens, mache (aka corn salad), arugula–they’re all happy to be direct sown while it’s still pretty cool out, as long as your garden bed isn’t actually soggy. And like lettuce, will tolerate half-day shade. Especially second-half-of-the-day shade. Radish: quick to grow, so start then early in March, then the next week start a few more, and carry on until they “bolt” (flower and set seed). Even then, the seed pods, when they’re small and green, are easily as tasty as the root vegetable. I’ve been known to plant radishes just for the seed pods. 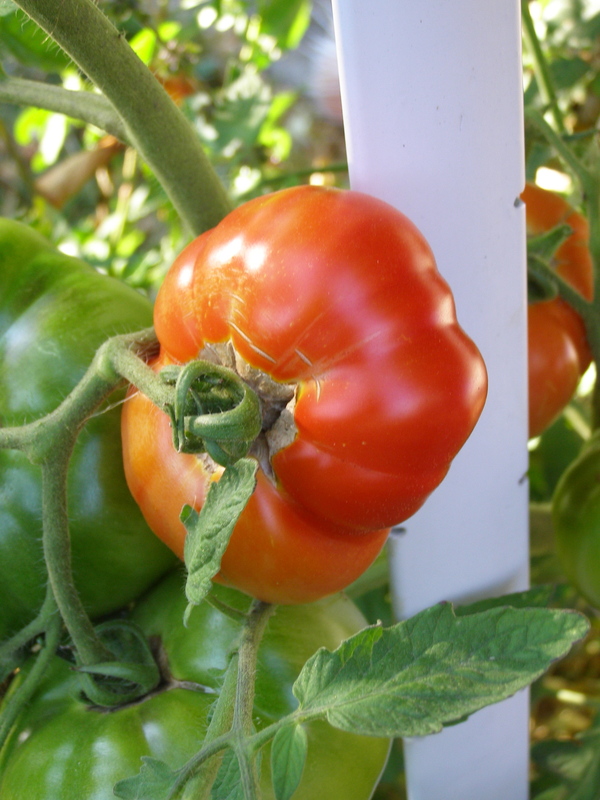 Tomatoes: Everybody’s favourite vegetable to grow ( not going to discuss the fruit/vegetable controversy!). 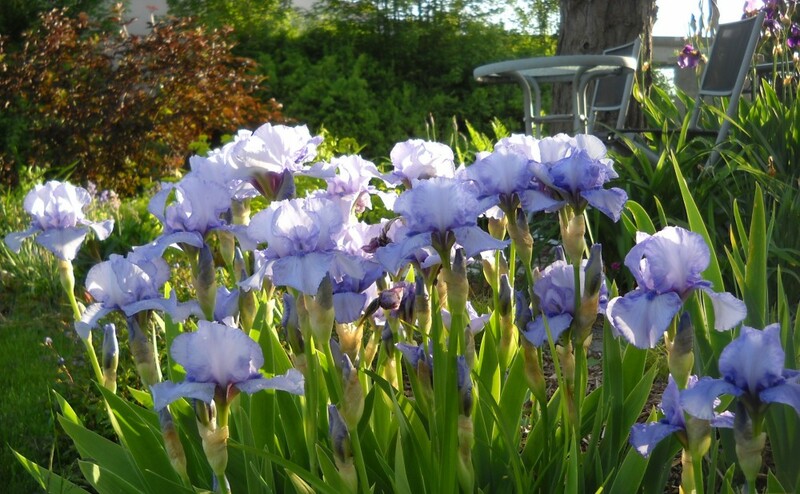 These need to grow in warming soil, and are slow to germinate unless the soil is warm. So start them indoors under bright light, and be slow to get them outdoors, not until the nights are consistently over 10 C. If you use the black plastic (or red plastic, as is often recommended!) 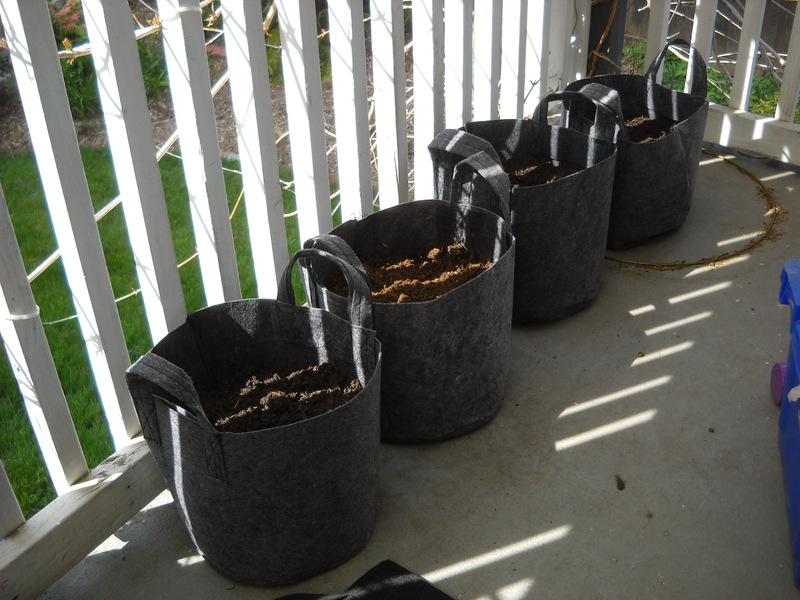 to warm the soil, you may be able to get them out as early as end April or beginning of May. I’ve tried the milk jug cloche idea. With limited success, but I’ll try it again this year. 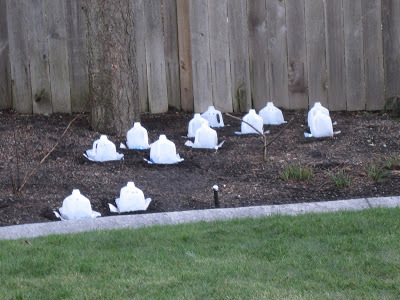 This isn’t my milk-jug-garden–my picture has disaapeared into the cloud. So thanks to Bonney Lassie for this image, which looks remarkably like mine. Only neater. Peas: are great. 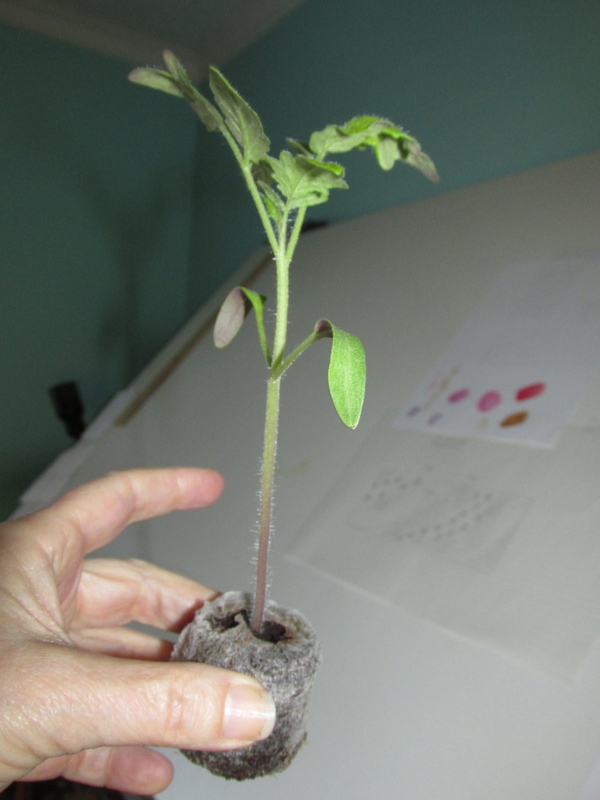 Can be started in or out, as early as February, as long as the soil isn’t soggy; But if started inside they’ll germinate MUCH faster, and get a head start on producing. Peas are a cool season crop, so they stop producing by early summer, so if you started them early indoors you’ll get a bigger, longer crop. But you can also sow again mid-summer for a fall harvest. Apparently. Haven’t tried that myself–maybe I will this year. Peas and beans can be treated with an “inoculant”, a rhizobium bacterium that develops a symbiotic relationship with the plant contributing to quite a lot of plant benefits. it’s not necessary, but almost always recommended in literature on pea growing. Broccoli: is one of those vegetables that can tolerate a lot of cold weather, so can be sown in spring for summer harvest, in early summer for fall harvest, and late summer for winter harvest. Read through the seed packets to know how long it takes for your particular variety to mature. There’s one that takes 7 months: you sow in late summer and harvest the following spring! Another takes 10-12 months! In any case start them inside under lights. Guess what: I didn’t read the seed packet! This is Purple Sprouting Broccoli, with days-to-maturity of 145 days. Meant to be sown indoors in June, planted out July for next Spring harvest. So what do you suppose I’ll get from it? With some of those vegetables, ones that don’t take an entire growing season to mature (unlike like tomatoes or squash), reserve part of the designated crop space for successive sowings. Radishes for example, being a quick-growing crop, can be sown ever week or so through the spring/early summer so there’s always radishes ready to harvest. Ditto for many leafy greens, carrots, beets… Some vegetables you can start indoors while your previous crop is maturing, so when you finish harvesting the first round, a second round is ready to transplant out. Just remember to give the planting bed an extra shovel of compost or cup of organic fertilizer.